This update is going to be slightly low on content but its still a required read in order to understand what Ill be doing later. Did my best to keep it entertaining, sorry guys! 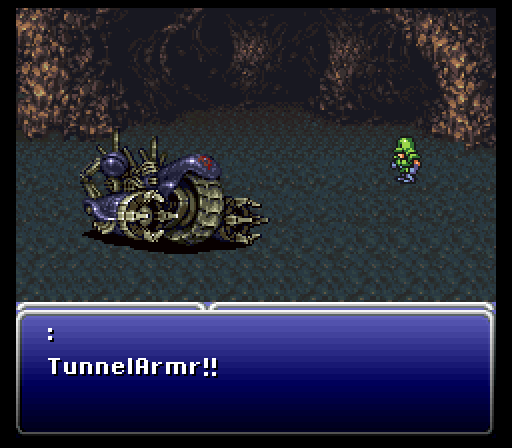 Now wait one moment Elephantgun, you might say, Why did Locke suddenly turn into a Green Soldier? I have no answer for that, but it in no way has anything to do with me being bad at taking screenshots and me accidently overwriting the save state I assure you! All joking aside, I ended up stealing the costume from a Soldier. Theres another side-effect to this glitch too. If you steal a soldiers outfit youll keep it throughout the game. Same thing applies with the Merchant's outfit. It never leaves Locke, even when you get to the World of Ruin. The only side-effect is that it screws up Lockes palette in the character-select screen. 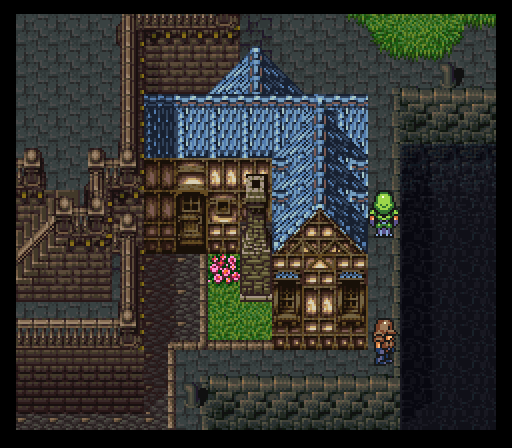 All sprites have predefined palettes assigned to them. Since youre able to save with Vicks/Wedge, whose sprites use a brown palette, the game automatically switches the Green to the Brown. 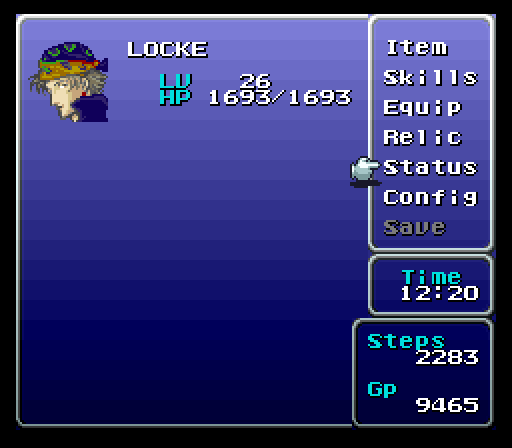 This causes Lockes character portrait to become distorted too. By doing this process and leaving South Figaro early, we skipped an important character  Celes. 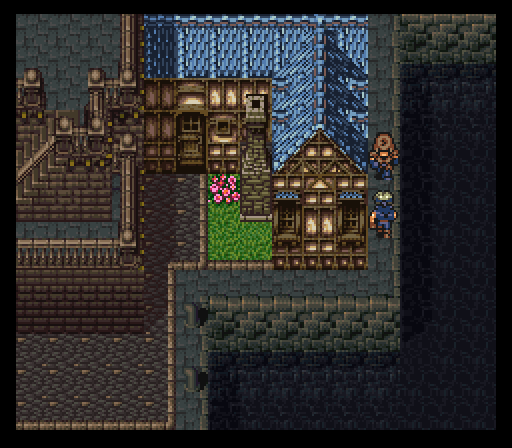 But when we fight him, Celes doesnt appear. Shes not in our party, so that makes a lot of sense. 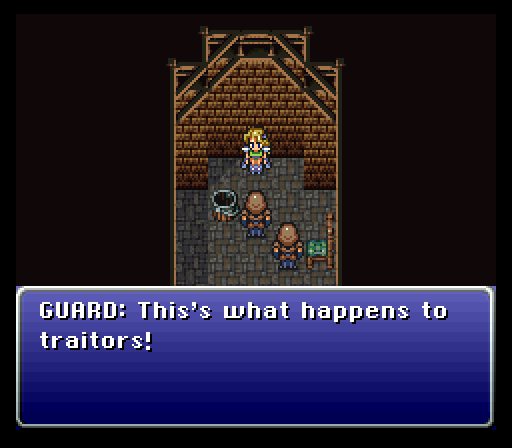 When we get Celes forced into a cutscene, well surprise is over because I showed it last update, but yeah. 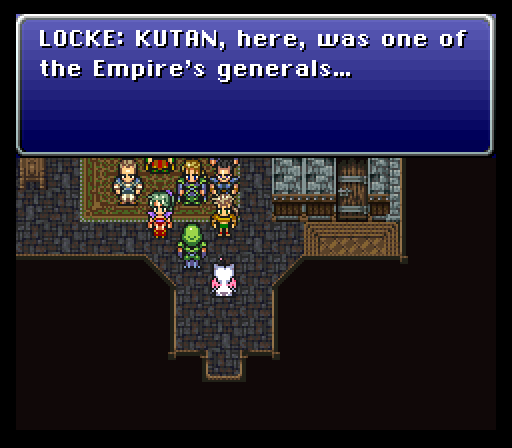 Kutans a Moogle. Thats not what Im here to explain though. We already know from the last update that skipping acquiring characters turns our characters into Moogles. Were here to answer why. Well, its actually very simple. In order to save memory space, the developers devised a system that would replace temporary characters with permanent characters as the game continues. 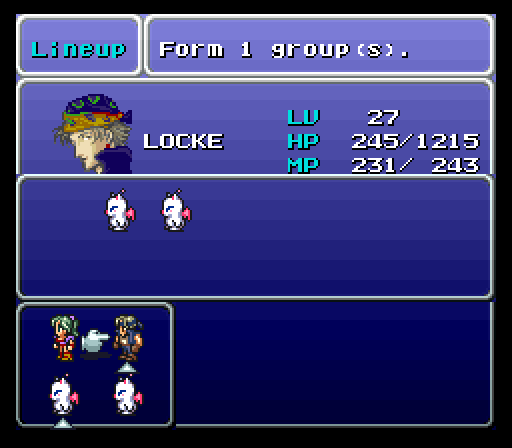 Because at the beginning of the game were greeted with 3 parties full of Moogles (and Locke), nearly every character data slot is initially placed with the Moogle character data. That means that before you acquire any character  Edgar, Sabin, Setzer, Shadow, Relm, etc, they are actually Moogles because the data was placed during that sequence. The trigger to replace Moogle character data with the permanent character data is when you name a character. This will change their sprite and their portrait, but in order to change their stats and ability to equip equipment you need to hit a certain trigger - usually the first time you use them in battle. 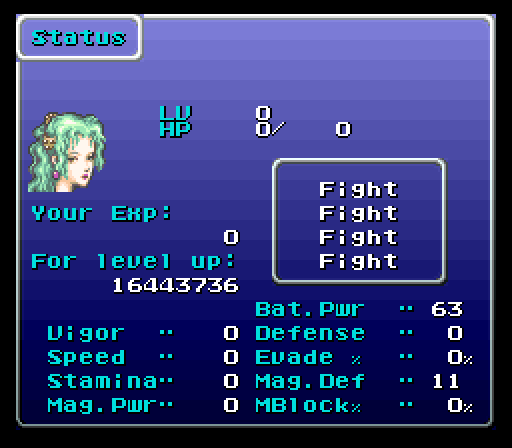 If there is a situation where a character joins prior to you naming them, the data is replaced when they join the party. In reality our characters havent been replaced by Moogles, the Moogles were prevented from being replaced by characters. Wed get the option to name her. 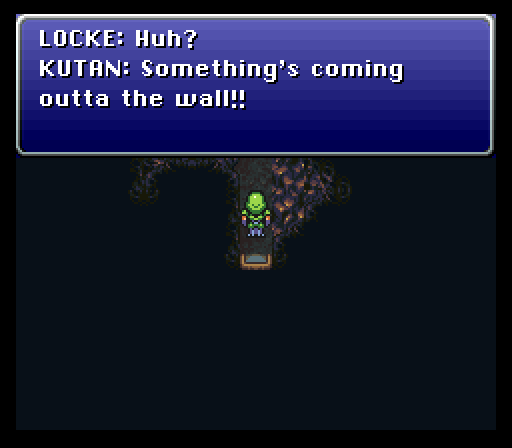 This will tell the game, Hey, overwrite Kutans character with Celes. That way when she joins our party, she wont be a level 5 useless Moogle that makes the World of Ruin a living hell. This was caused by skipping the naming sequence of the characters. Now, the game treats the Moogles like the character you're supposed to have. 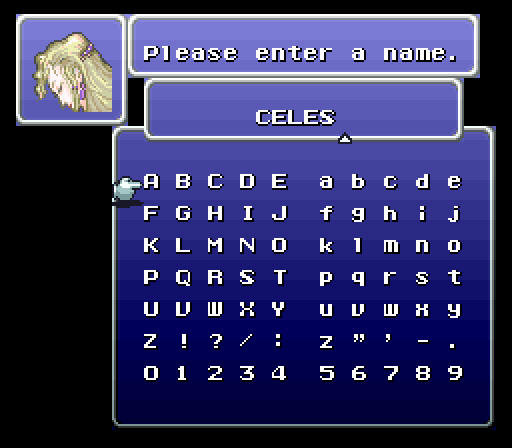 With very few exceptions does the game consider the Moogles anything other than Celes, Edgar, etc. This is because scripts in the game dont tell the game move Celes 4 squares right and make her say THIS, the game says move character_7 4 squares right and make character_7 say THIS. Its because of this that skipping characters entirely doesnt make the game an unplayable mess. I should mention that despite them taking up the same character slot they don't share anything but their ability to be interacted with by scripts. Their levels, stats, equipment, ability to be equipped, all remain separate. You might have noticed that in our last update we only had 5 of the Moogles, but 10 come to defend us alongside Mog and Locke. 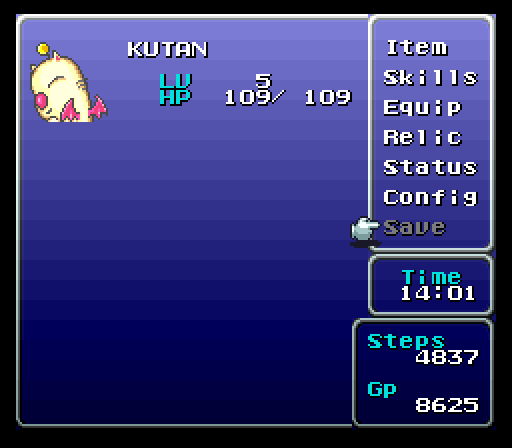 The other Moogles were missing are Kushu Kupan Kurin Kamog and Kupop. There are 16 character slots total, 14 of which are playable. 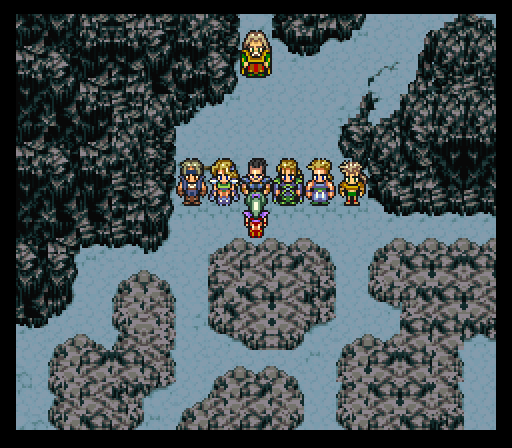 Its possible to figure out what character slots these Moogles occupy, but honestly I havent gotten around to it. Doing entirely separate playthroughs that provide no glitch except to figure out what character replaces what Moolge isnt fun and is horribly tedious  in some cases impossible. Ill update this post as I figure it out, but I do know that the only character that is never replaced with one of the 10 Moogles is Umaro. 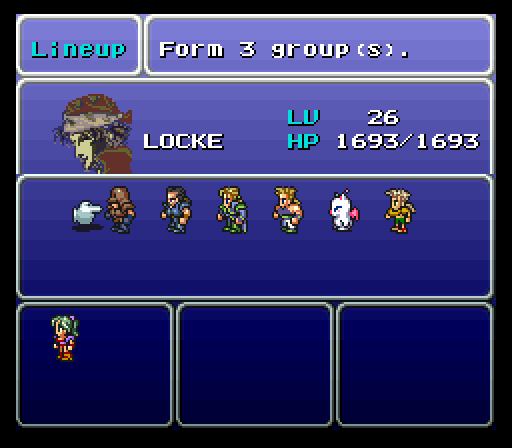 (Remember, there are 10 Moogles, Mog, Terra, and Locke, which is 13 of the 14 playable slots, so someone has to be the odd man out). Ill show how I know this later, but for now just take my word on it. You might be wondering who the other 2 character slots are. 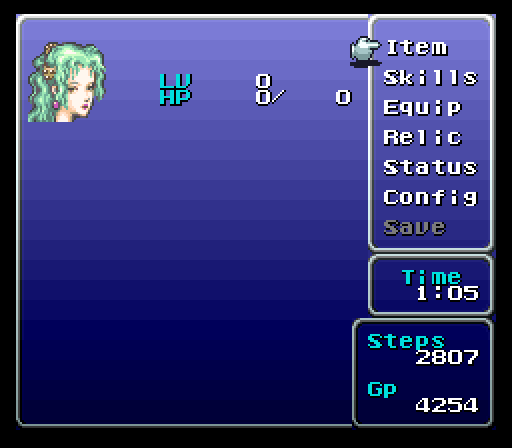 The two other slots are plot-important temporarily playable characters and Kefka. 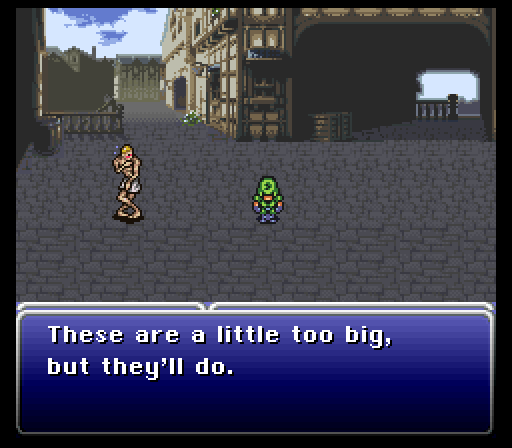 DOES THIS MEAN THAT KEFKA WAS ORIGIN- No, he was never intended to be a playable character. 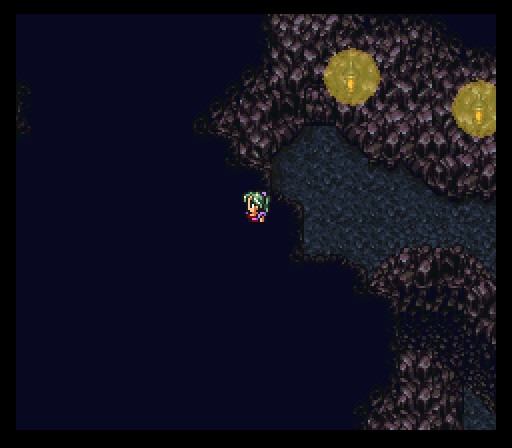 See, throughout the game Kefka is heavily animated during battle and has a sprite assigned to him. 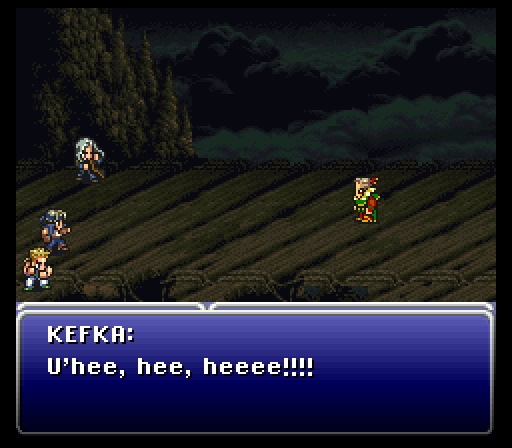 The only way the programmers could do this was to actually make a Kefka sprite, place him in your party, and animate him around the battle-field. At the end of the battle, hes removed from your party. 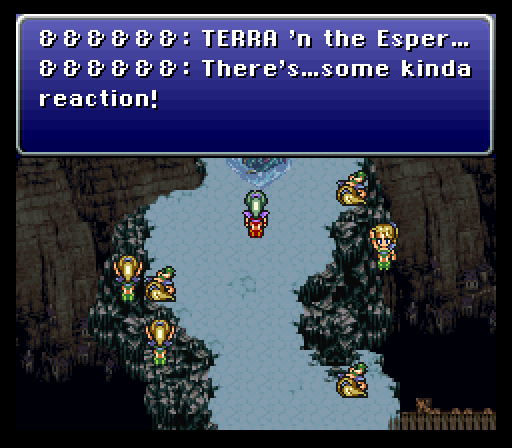 They heavily animate sprite throughout the game with other characters and situations as well; the Terra casting magic scene after you escape Castle Figaro being the first that comes to mind. 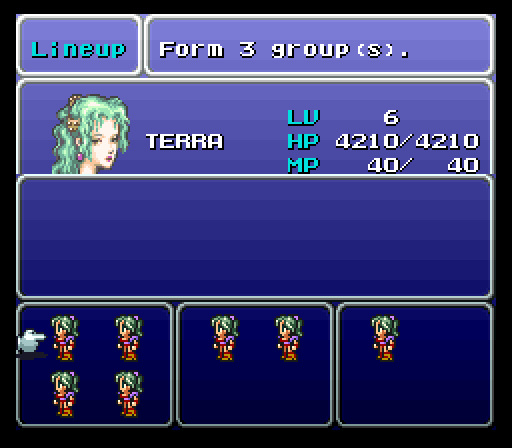 In order to do this, they couldnt temporarily replace one of your characters and exchange them with Kefka simply because it would be complicated to implement and would cause issues. 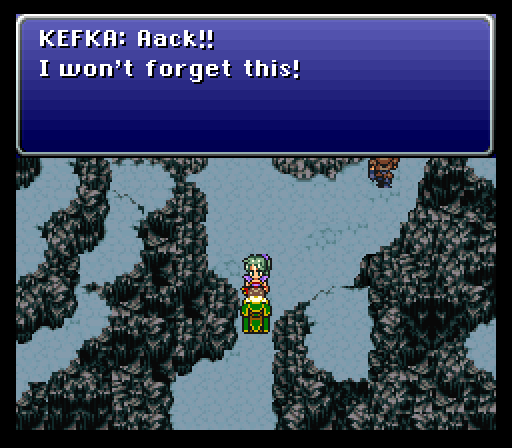 Instead, they created a whole new character slot dedicated entirely to Kefka. 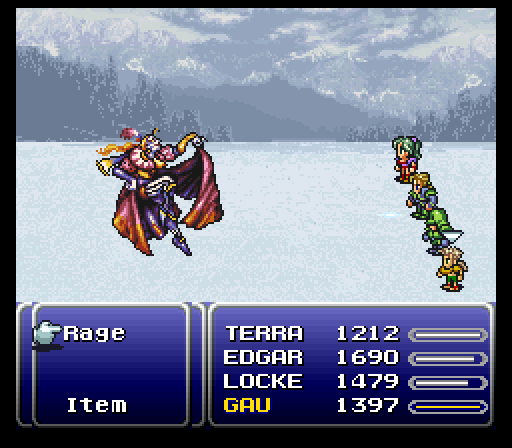 Youll notice that in battles where its possible to take 4 characters at a time to a battle, Kefka is instead a rendered monster rather than a sprite. You cant have more than 4 character sprites on the battlefield at a time. 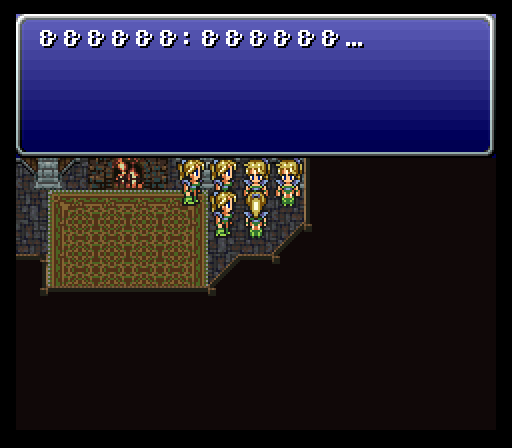 Every time you fight sprite-Kefka you have 3 or less characters. Pretty clever! Now, we know that the standard path of character transformation is Moogles -> Character, but what are characters before theyre Moogles? In order to figure out, I had to use a Game Genie and use a walk through walls code. 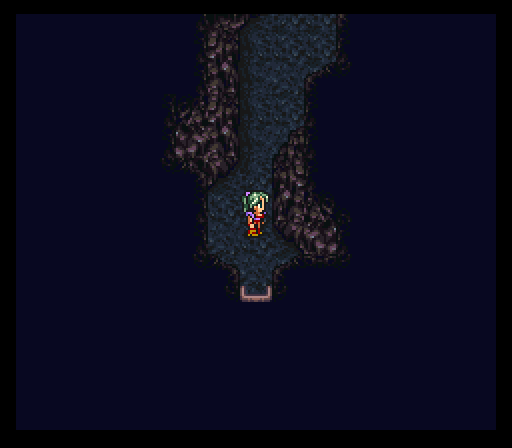 This is right at the beginning of the game, moments before Terra falls into the pit and the Moogles come to rescue her. By skipping this sequence Im attempting to figure out if the Moogles are default, or if theres some other character every character slot initially begins as. As you can see, weve skipped the pit entirely. This is the first indication that something exciting is happening: who the hell is &&&&&&? 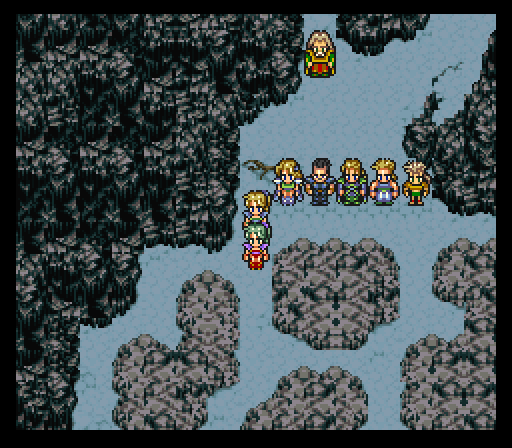 Well the script were activating is when Banon, Edgar, and Terra are re-entering Narshe. The first time you go through this place youre expected to have them, so they speak by default. 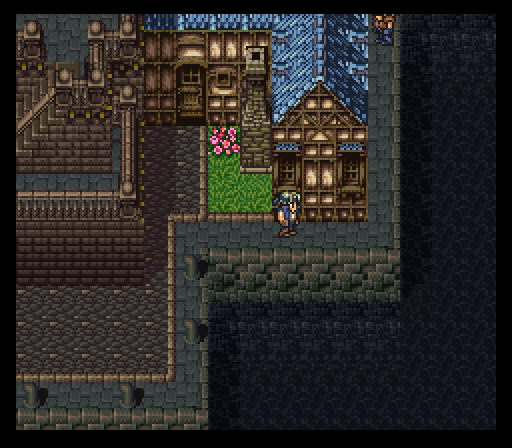 Luckily the guard doesnt come and chase us off when we attempt to re-enter Narshe. That script doesnt activate until we acquire Locke apparently. 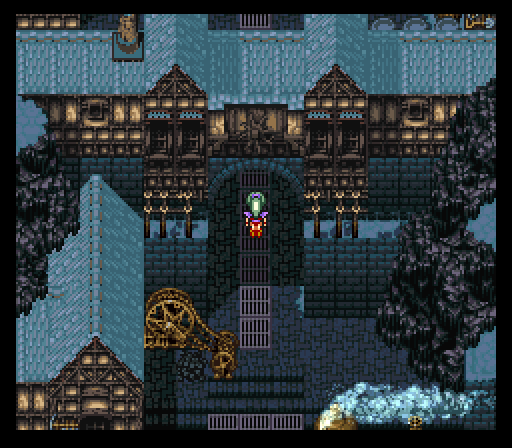 Remember, the first time were in this section is when were defending Baron from Kefkas army so hopefully our entire lineup of characters will be at the top waiting for us. 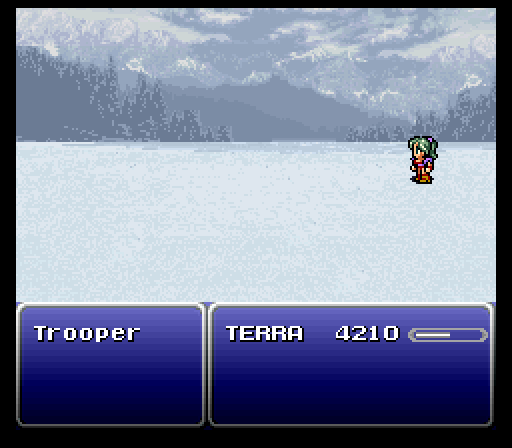 Theres no way in hell I could defeat an entire army with a level 6 Terra. Gameshark time! Wait, what? 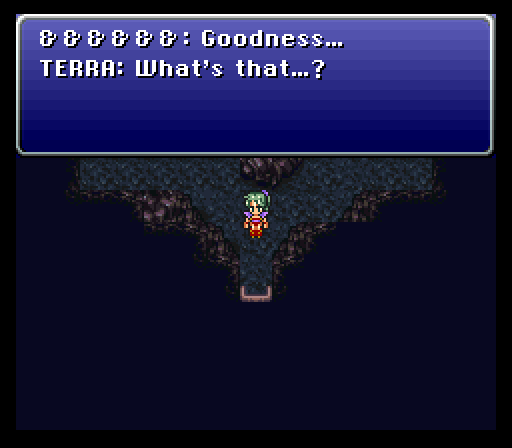 Terra with Celess color palette? Its a pretty simple explanation. 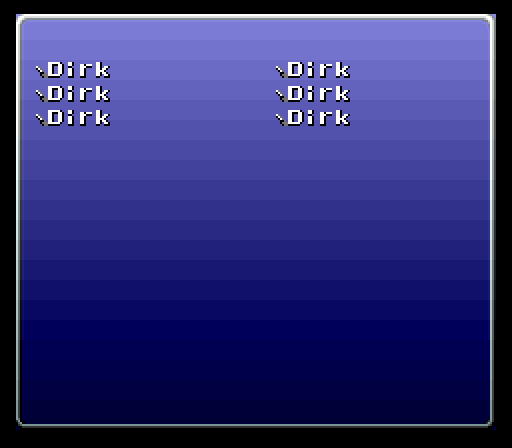 Dirks, 0, Terra, and Celess sprite sheet all start with the hex DD in the attribute slot. I would image that & is DD as well. DD is simply the Default. Im surprised that we got a bunch of stable characters rather than what looked like a bunch of pixels thrown into a blender. It's also interesting to note that Amano's original design for Terra was blonde. 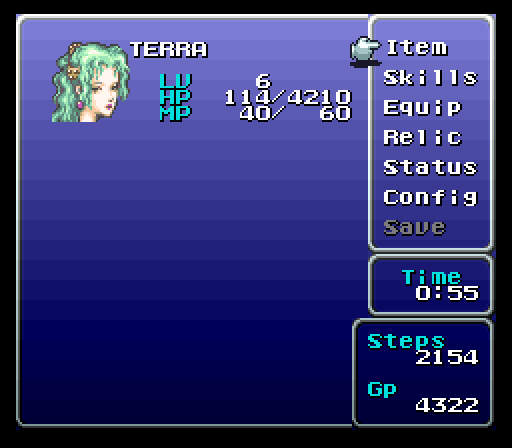 This is probably why Celes's palette is the first, they intended it to be assigned to Terra. Just a little interesting tidbit. 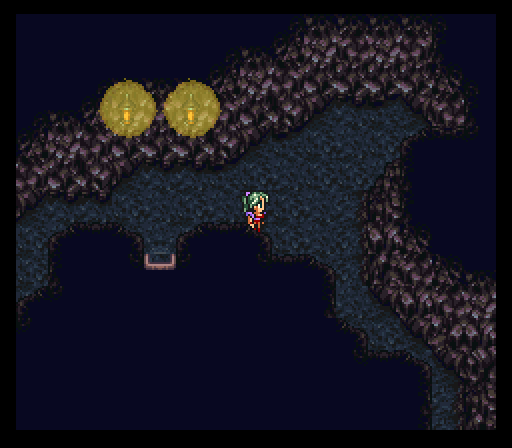 After beating up Kefka the game continues the following scenes pretty normally. The characters still interact and talk as theyre supposed to. Remember, the game says character_2 in scripts, not Locke. After this point the game becomes completely unplayable. 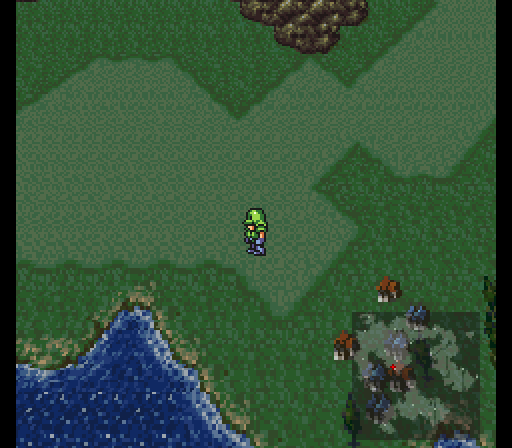 Whenever you enter a battle you become instantly Annihilated (aka Game Over). 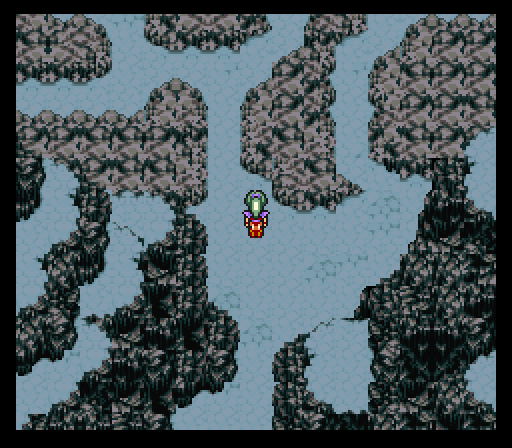 You can gameshark no-encounters your way to Shadow who can solo you through Zozo, but at a certain point he leaves you and then you're out of luck.